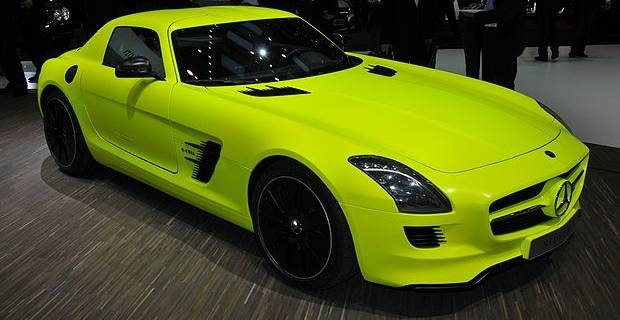 The Mercedes SLS AMG is a luxury GT developed by Mercedes-AMG as a replacement for the SLR McLaren. It’s the first Mercedes to be designed in-house by AMG and has been on sale in Europe since 2010. Four variants of the SLS have been produced. The SLS AMG GT3, which was developed to compete in the FIA GT3 Championship, is a race car which was first unveiled in mid-2010. The one off ‘Blackbird’ was produced in the same year and exhibited at the Australian International Motor Show. A roadster variant with a soft-top and conventional doors was unveiled a year later and the most recent variant to be announced is the SLS AMG E-Cell. The AMG E-Cell is a model planned for 2013 which will use all-electric powertrain components. Four electric motors power the car and produce a combined rating of 525bhp. The SLS AMG E-Cell will accelerate from 0 to 60mph in 4 seconds, which is only 2 tenths of a second slower than the ‘standard’ car, and will achieve 150mph. As with the recent advancements achieved with diesel power, which has gone from fuelling commercial vehicles to powering Le Mans 24 Hours winners, electric power is poised to make great leaps in the near future. With zero emissions, incredible handling, impressive looks and very low noise levels, will the Mercedes-Benz SLS AMG E-Cell be the car to lead the way by showing that electric power doesn’t have to be limited to family cars like the Nissan Leaf and the upcoming Ford Focus Electric.